In archaeology, mesolithic (Greek: μεσος, mesos "middle"; λιθος, lithos "stone") is the culture between paleolithic and neolithic. The term "Epipaleolithic" is often used for areas outside northern Europe, but was also the preferred synonym used by French archaeologists until the 1960s. Terminology - Mesolithic or Epipaleolithic? In the terminology of prehistoric archeology, the most widespread trend is to use the term "Epipaleolithic" for the industrial complexes of post-glacial hunter-gatherer groups. Conversely, those that are in course of transition toward artificial food production are assigned to the "Mesolithic". 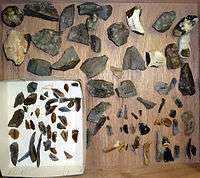 In the archaeology of sub-Saharan Africa, Lower Paleolithic is replaced by "Early Stone Age", Middle Paleolithic is replaced by "Middle Stone Age" and Upper Paleolithic by "Later Stone Age" according to the terminology introduced by John Hilary Goodman and Clarence van Riet Lowe of South Africa in the early 20th century. Therefore, care must be taken in translating "Mesolithic" as "Middle Stone Age", as the latter term has an unrelated technical meaning in the context of African archaeology. When Hodder Westropp introduced the Mesolithic in 1866, as a technology intermediate between Paleolithic and Neolithic, a storm of controversy immediately arose around it. A British school led by John Evans denied any need for an intermediate. The ages blended together like the colors of a rainbow, he said. A European school led by Louis Laurent Gabriel de Mortillet asserted that there was a gap between the earlier and later. Edouard Piette claimed to have filled the gap with his discovery of the Azilian Culture. Knut Stjerna offered an alternative in the Epipaleolithic, a continuation of the use of Paleolithic technology. By the time of Vere Gordon Childe's work, The Dawn of Europe (1947), which affirms the Mesolithic, sufficient data had been collected to determine that the Mesolithic was in fact necessary and was indeed a transition and intermediary between the Paleolithic and the Neolithic. The Paleolithic was an age of purely hunting and gathering while in the Neolithic domestication of plants and animals had occurred. Some Mesolithic peoples continued with intensive hunting. Others were practising the initial stages of domestication (see Khiamian). Natufian culture is commonly split into two subperiods: Early Natufian (12,500–10,800 BC) (Christopher Delage gives c. 13,000–11,500 BP uncalibrated, equivalent to c. 13,700 to 11,500 BC) and Late Natufian (10,800–9500 BC). The Late Natufian most likely occurred in tandem with the Younger Dryas. The Mesolithic began with the Holocene warm period around 11,660 BP and ended with the introduction of farming, the date of which varied in each geographical region. Regions that experienced greater environmental effects as the last glacial period ended have a much more apparent Mesolithic era, lasting millennia. In northern Europe, for example, societies were able to live well on rich food supplies from the marshlands created by the warmer climate. Such conditions produced distinctive human behaviors that are preserved in the material record, such as the Maglemosian and Azilian cultures. 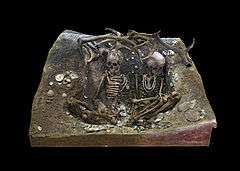 Such conditions also delayed the coming of the Neolithic until as late as 5000–4000 BC in northern Europe. ↑ Bahn, Paul, The Penguin Archaeology Guide, Penguin, London, pp. 141. ISBN 0-14-051448-1. ↑ A. Moure. El Origen del Hombre, 1999. ISBN 84-7679-127-5. ↑ Munro, Natalie D. (2003). "Small game, the Younger Dryas, and the transition to agriculture in the southern Levant" (PDF). Mitteilungen der Gesellschaft für Urgeschichte. 12: 47–71. ↑ Bar-Yosef, Ofer (1998). "The Natufian Culture in the Levant, Threshold to the Origins of Agriculture" (PDF). Evolutionary Anthropology. 6 (5): 159–177. doi:10.1002/(SICI)1520-6505(1998)6:5<159::AID-EVAN4>3.0.CO;2-7. ↑ T.Douglas Price, Europe's first farmers (Cambridge University Press 2000), page 5. ↑ D. W. Anthony, Pontic-Caspian Mesolithic and Early Neolithic societies at the time of the Black Sea Flood: a small audience and small effects, in V. Yanko-Hombach, A.A. Gilbert, N. Panin and P. M. Dolukhanov (eds. ), The Black Sea Flood Question: changes in coastline, climate and human settlement (2007), pp. 245-370 (361); D. W. Anthony, The Horse, The Wheel and Language (2007), pp.148-9, p. 480, note 19. ↑ Detlef Gronenborn, Beyond the models: Neolithisation in Central Europe, Proceedings of the British Academy, vol. 144 (2007), pp. 73-98 (87). Milner, N. et al. (2016) A Unique Engraved Shale Pendant from the Site of Star Carr: the oldest Mesolithic art in Britain Internet Archaeology 40.